↑ Eng CM, Kozak CA, Beaudet AL, Zoghbi HY (Apr 1991). "Mapping of multiple subunits of the neuronal nicotinic acetylcholine receptor to chromosome 15 in man and chromosome 9 in mouse". Genomics. 9 (2): 278–282. doi:10.1016/0888-7543(91)90253-B. PMID 2004777. 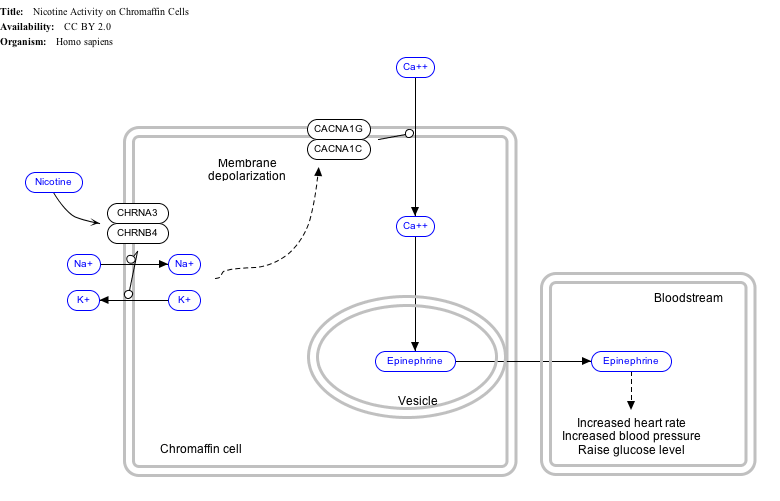 ↑ "Entrez Gene: CHRNB4 cholinergic receptor, nicotinic, beta 4". Green WN, Millar NS (1995). "Ion-channel assembly". Trends Neurosci. 18 (6): 280–287. doi:10.1016/0166-2236(95)93915-K. PMID 7571003. Tarroni P, Rubboli F, Chini B, et al. (1992). "Neuronal-type nicotinic receptors in human neuroblastoma and small-cell lung carcinoma cell lines". FEBS Lett. 312 (1): 66–70. doi:10.1016/0014-5793(92)81411-E. PMID 1330682. Anand R, Lindstrom J (1992). "Chromosomal localization of seven neuronal nicotinic acetylcholine receptor subunit genes in humans". Genomics. 13 (4): 962–967. doi:10.1016/0888-7543(92)90008-G. PMID 1505988. Papke RL, Heinemann SF (1992). "The role of the beta 4-subunit in determining the kinetic properties of rat neuronal nicotinic acetylcholine alpha 3-receptors". J. Physiol. (Lond.). 440: 95–112. PMC 1180142 . PMID 1725184. Elliott KJ, Ellis SB, Berckhan KJ, et al. (1997). "Comparative structure of human neuronal alpha 2-alpha 7 and beta 2-beta 4 nicotinic acetylcholine receptor subunits and functional expression of the alpha 2, alpha 3, alpha 4, alpha 7, beta 2, and beta 4 subunits". J. Mol. Neurosci. 7 (3): 217–228. doi:10.1007/BF02736842. PMID 8906617. Chavez-Noriega LE, Crona JH, Washburn MS, et al. (1997). "Pharmacological characterization of recombinant human neuronal nicotinic acetylcholine receptors h alpha 2 beta 2, h alpha 2 beta 4, h alpha 3 beta 2, h alpha 3 beta 4, h alpha 4 beta 2, h alpha 4 beta 4 and h alpha 7 expressed in Xenopus oocytes". J. Pharmacol. Exp. Ther. 280 (1): 346–56. PMID 8996215. Groot Kormelink PJ, Luyten WH (1997). "Cloning and sequence of full-length cDNAs encoding the human neuronal nicotinic acetylcholine receptor (nAChR) subunits beta3 and beta4 and expression of seven nAChR subunits in the human neuroblastoma cell line SH-SY5Y and/or IMR-32". FEBS Lett. 400 (3): 309–314. doi:10.1016/S0014-5793(96)01383-X. PMID 9009220. Gerzanich V, Kuryatov A, Anand R, Lindstrom J (1997). ""Orphan" alpha6 nicotinic AChR subunit can form a functional heteromeric acetylcholine receptor". Mol. Pharmacol. 51 (2): 320–7. PMID 9203638. Hellström-Lindahl E, Gorbounova O, Seiger A, et al. (1998). "Regional distribution of nicotinic receptors during prenatal development of human brain and spinal cord". Brain Res. Dev. Brain Res. 108 (1–2): 147–160. doi:10.1016/S0165-3806(98)00046-7. PMID 9693793. Boorman JP, Groot-Kormelink PJ, Sivilotti LG (2001). "Stoichiometry of human recombinant neuronal nicotinic receptors containing the b3 subunit expressed in Xenopus oocytes". J. Physiol. (Lond.). 529 (3): 565–77. doi:10.1111/j.1469-7793.2000.00565.x. PMC 2270211 . PMID 11118490. Lev-Lehman E, Bercovich D, Xu W, et al. (2001). "Characterization of the human beta4 nAChR gene and polymorphisms in CHRNA3 and CHRNB4". J. Hum. Genet. 46 (7): 362–366. doi:10.1007/PL00010921. PMID 11450844. Groot-Kormelink PJ, Boorman JP, Sivilotti LG (2001). "Formation of functional alpha3beta4alpha5 human neuronal nicotinic receptors in Xenopus oocytes: a reporter mutation approach". Br. J. Pharmacol. 134 (4): 789–796. doi:10.1038/sj.bjp.0704313. PMC 1573006 . PMID 11606319.